Please REPORT ALL CRIMES (“call 9-1-1”) – crime data is collected by The City of Dallas and we’ll get our fair share of patrol officers. If you don’t report crime, it’s just like telling the City to send the officers to another part of town! Need some tips to avoid becoming a victim? Check out our Crime Watch page. 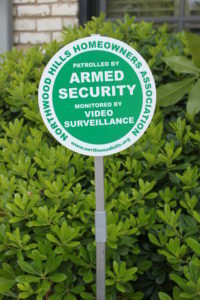 Northwood Hills is patrolled by private armed security and NHHA members are able to contact the patrol directly and receive additional benefits. Learn more here. Did you get a security sign? 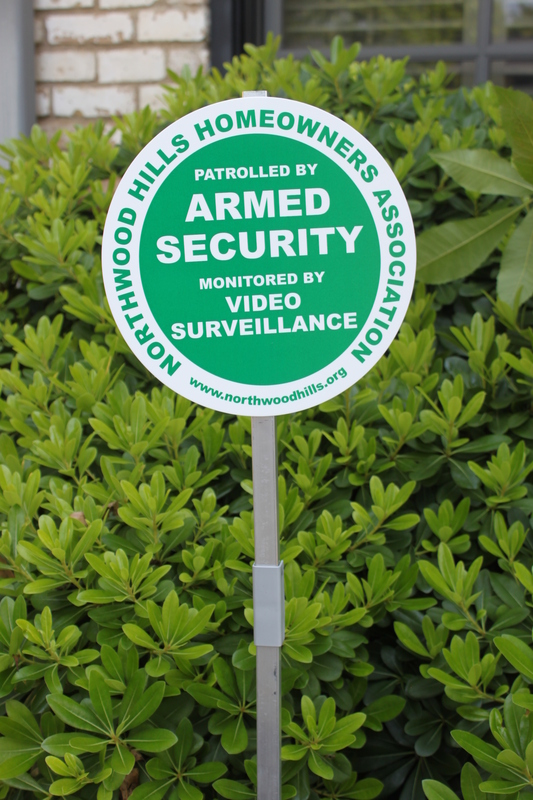 NHHA has created custom yard security signs announcing that Northwood Hills is patrolled by armed security and monitored by video surveillance. The crisp, eye-catching design and clear message make it a meaningful addition to the multi-faceted approach each homeowner needs to be taking in their security endeavors. Want to get one for your yard? If you’re not a current member, join NHHA or renew your membership today. Members can email Membership to request their sign. The number for the security patrol is private and available to members only. Members receive the number each year in their renewal packet. The number has changed as of 10/2/17 and members received notice by letter and email. We encourage you to program it into your smartphone or post it near your home phone. If you are a Member who has misplaced the security patrol number, please email Membership. We strongly encourage homeowners to install surveillance cameras on their own properties for the purpose of both deterrence and aiding in police investigations. There are a multitude of options available now, including many that don’t require a large initial or ongoing monetary investment. Most alarm companies offer video surveillance options; visual doorbells are available without needing a contract with an alarm company; and individual cameras are available for purchase for use with a DVR. Have at least one surveillance camera on your property that is in working condition, that either records continuously or when motion is detected, AND has the capability to access footage for at least the past 10 days. Make sure you have the option to review and download footage. Further, be willing to allow your name and contact information to be on a list that NHHA maintains, for the sole purpose of making your footage available to law enforcement if they request it in the course of an investigation. This list will not be shared with any party outside of law enforcement and will only serve as a potential aid to detectives during an investigation. Your contact information would be provided to law enforcement upon their request, not at the request of another resident. If you already have video surveillance at your house, with accessible archived footage, and are willing to cooperate with a police request for footage if a circumstance necessitates it, please email us to let us know. If you don’t have video surveillance set up yet, use this offer as the push you need to get it done. It can be as simple as installing a visual doorbell on your front door and signing up for a low-cost plan to store the footage it records. That qualifies! 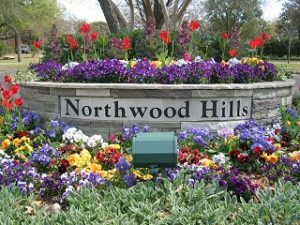 We are always looking for ways to enhance the prestige and appeal of Northwood Hills and making our neighborhood a bad choice for criminals is part of that approach. Thanks for partnering with us to continually improve our community.